The experienced Naoimh Quigg’s 4 and 3 win over Caroline Adams was soon followed by Jessica Ross’s 2 up win over Lucy Simpson. The score remained at one game each until Emma Forbe’s 4 and 3 victory over Sonia Hopley gave Royal Portrush the lead again. All eyes were on the second and fourth matches as both teams battled for a place at the National Final in Greystones in August. News of Hannah Henderson’s 2 and 1 win over Brooke Hopley had not filtered back to the 18 green before the indomitable Gemma McClenaghan halved the hole to claim her match against Nikki Currie 1 up. On the first day of the Championship, the early morning rain eventually gave way to bright sunshine. In the preliminary round, Royal Belfast beat Bangor 4-1 as Victoria Craig, Marilyn Henderson and Alex Barnes secured the three matches necessary to secure their place in the next round. Shandon Park beat Ballycastle 3-2 thanks to win for Jenny Young, Helen McCarthy and Diane Conway as Belvoir Park defeated Holywood 4-1. In the first of the matches involving the seeded teams, Malone caused a major upset when they claimed a 3.5-1.5 victory over Lurgan. Malone’s Siobhan Greene was four down with five to play to Maeve Cummins but fought back to win on the 18th and put her club in the semi finals. Royal Portrush’s Lucy Simpson, Gemma McClenaghan and Naiomh Quigg set up a 4-1 over Shandon Park with 4 and 3, 7 and 5 and 7 and 5 victories over Jenny Young, Helen McCarthy and Diane Nickels respectively. Last year’s winners Ulster District Senior Cup winner Clandeboye had three very significant wins of 6 and 5, 7 and 6 and 5 and 4 by Jessica Ross, Nikkie Currie and Brooke Hopley as they beat Royal Belfast 4-1. Royal County Down Ladies' Olivia Mehaffey returned the first win for her team against Belvoir Park with a 5 and 3 victory over seasoned campaigner Violet McBride. But Jenny Gibson’s 3 and 2 win over former professional Danielle McVeigh evened the score and the remaining matches were keenly fought until team captain Anita McCaw beat Belvoir Park’s Anna Morwood 3 and 2. Gail Linter’s experience gave her a 4 and 2 victory over young Laura McCaw, leaving the sides all square. It all came down to the final match that saw Olivia McClure beat Kate Evans 2 and 1 and set up a semi-final match with Clandeboye. In the first of the plate matches neighbouring clubs Bangor and Holywood keenly contested for a semi-final place with Bangor finally getting the win. Lurgan and RCDL's decision not to participate in the Plate competition resulted in a walkover for Ballycastle and Bangor into the final that ended with Bangor winning 3-2. Rita McCormick’s early win of 4 and 3 over Jacque Hamilton gave great encouragement to the Ballycastle team and their supporters. However Finola Duncan’s 3 and 2 win over Fiona Glass balanced the scores. 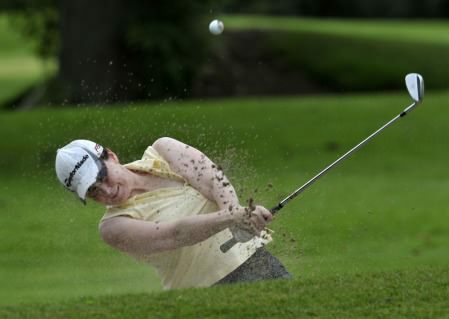 The next two matches were decided on the 18th green before Rachel Graham won her match against Una McQuillan on the 19th hole to give Bangor the title. Susan Crawford lost to Sheena McWilliams 1 up. Eileen Rose Power had a crucial 2-up win to help Kilkenny secure a meeting with champions Royal Portrush in the Irish Senior Cup final on Saturday.Defending champions Royal Portrush will play and Kilkenny in Saturday’s Irish Senior Cup final after securing victories over Castletroy and Enniscorthy in this afternoon’s semi finals at Portumna. Melanie Mitchell (capt.) pictured with the Royal Portrush Ladies team after their victory over Kilkenny in the 2013 All Ireland Senior Cup final at Portumna. 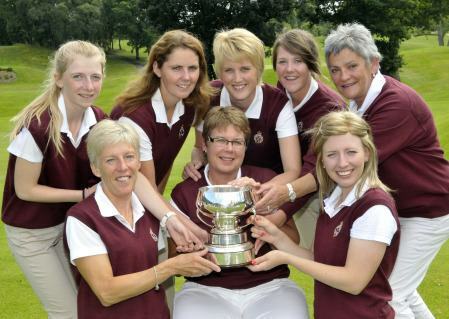 From left Hannah Henderson, Helen Jones (Lady Captain), Naoimh Quigg, Victoria Bradshaw, Collette McNicholl, Maud Wilson (manager) and Lucy Simpson. Picture by Pat CashmanDefending champions Royal Portrush won their 26th Irish Senior Cup title with a 3½-1½ victory over Kilkenny in this morning’s final at Portumna Golf Club.